Low-cost insurance for learner drivers! Enjoying your lessons but would like to get some more practice at home? Mum and Dad too scared to put you on their policy in case you ruin their full no-claims discount they’ve spent years accumulating? Well now you can get insured without any risk to their insurance! Sounds good? We think so! Collingwood Insurance now offer Flexible Short Term Insurance For Learner Drivers, enabling you to insure any car, Group 15 or less and under £20,000 in value, from as short a period as a week. 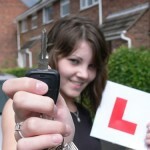 Why not get a bit more practice in at home to give you an even better chance of passing your driving test first time? Drive your parents, grandparents, friends or relatives car without any risk to their insurance. Just take out a policy for each vehicle when you need it. After an inital 28 day policy, cover can be renewed for a period of 7, 28 or 84 days. Interesting post – not tried Collingwood yet but it sounds almost too good to be true!